The mole's head is fit to its movements in an environment strewn with obstacles (roots, pebbles...). At the end of the upper jaw, its elongated snout is useful to raise the earth. Thanks to its morphology and very short neck, the mole is able to tilt its head back with such tremendous strength. 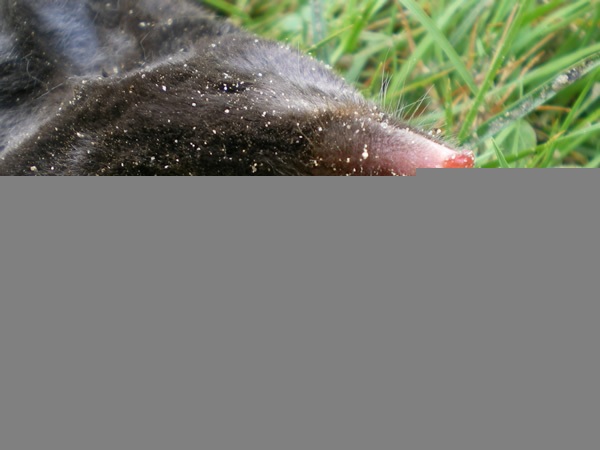 The mole's eyes – the size of a pinhead – may be covered with a transparent membrane. Its eyes are helpful only to distinguish day from night. Thanks to its sense of smell, the mole moves towards its prey, spies on it, senses it and reaches it in the darkness of the tunnel. The mole's sense of smell has developed at the expense of its sense of sight: it is able to detect an earthworm through 6 cm of ground. The absence of external ears helps the mole moving easier into the tunnels. 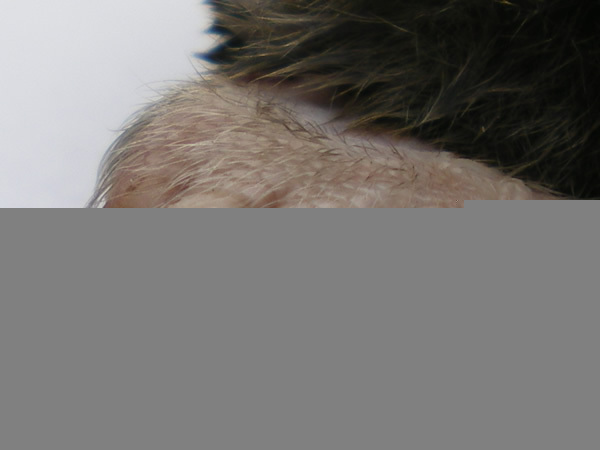 Its ears are almost invisible so that the mole is not hampered in its movements. Yet a keen hearing allows the mole to hear earthworms digging the ground. 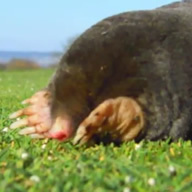 Its enlarged forefeet help the mole burrowing tunnels up to 20 metres a day. The evacuated soil shapes molehills (mounds of soil). The volume of the surface molehill is proportional to the tunnel's depth; the larger the surface molehill, the deeper is the tunnel. 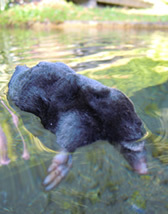 Thanks to its paws, the mole can also swim and it can stay under water for several minutes. 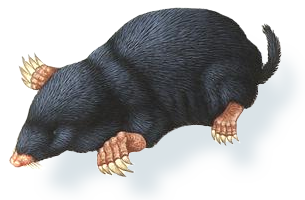 The mole uses its paws to scrape the collected soil away – up to twenty times its weight – when burrowing new tunnels. The mole evacuates one third of the newly dug tunnel's soil and the remaining soil is tamped down on surface walls to reinforce their structure. Its tail just like its snout's bristles are extremely sensitive tactile organs used as detectors. 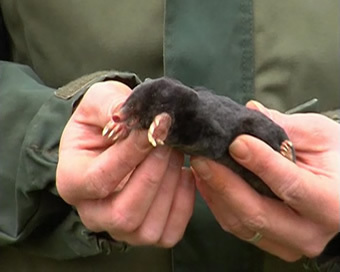 When the mole moves underground, its tail is always carried erect so that its hairs can brush against the tunnel roof. 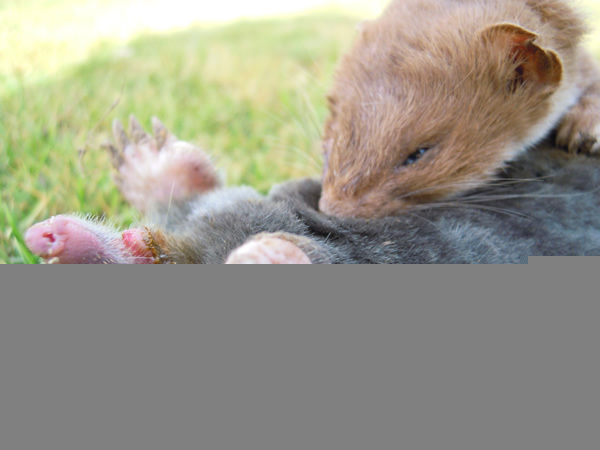 A 12-hour fast kills the mole, so it stores earthworms in a tunnel near its nest. Each mole's litter has 3-5 youngs during the spring breeding season. Litters stay with their mother during the one-month nursing period. Depending on the region you're located in, there may be from 5 to 50 moles per hectare in the ground. In fact, it depends on the soil's nutritional value. The average mole's lifespan is from 4 to 6 years. Death is due to tooth loss – teeth being worn down by the soil's abrasive sand. 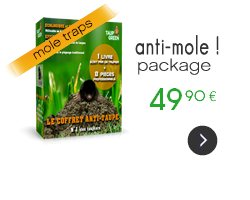 Its enlarged forefeet help the mole burrowing tunnels up to 20 metres a day! The network of tunnels has an average length that may vary from 200 to 250 metres for only one mole!